Services like surf lessons, visit to National Parks, tea estates etc. 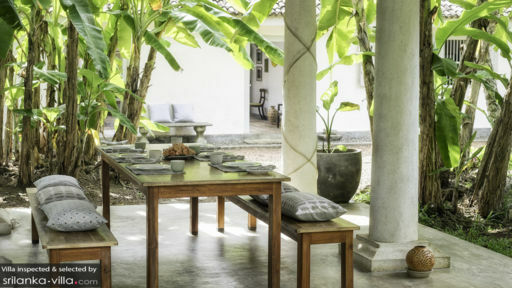 Found amidst the natural beauty of Southwest Sri Lanka, Sakara House is truly a home away from home complete with a courtyard, and Ambalamba (an outdoor lounge area), private swimming pool, and much more! 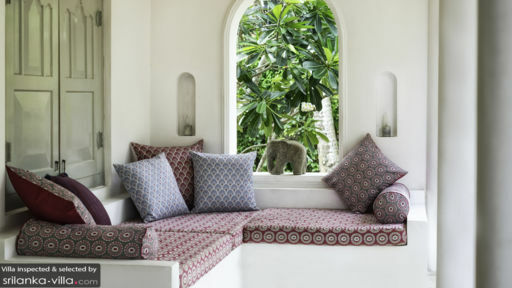 Designed in a traditional, Sri Lankan fashion the villa is a tropical paradise with luscious gardens featuring frangipani, coconut and banana trees, and other exotic varieties of plants. The beautiful house has four bedrooms found either around the courtyard or inside the main house for easy access to all parts of the house! As there are four bedrooms at Sakara House, two are found around the courtyard, and two are located in the main house. The master bedroom is the most spacious, situated in the main house complete with a king-sized, four-poster bed draped with a mosquito net. There is luxury cotton linen for a restful sleep, and the traditional décor will make you feel right at ease. There is also an en-suite bathroom with a large shower area and a beautiful décor. Another king room is found around the courtyard, with a king-sized bed, wooden flooring, and a mosquito net. This room has a partially, open-air en-suite bathroom with a tropical shower. The third or main house bedroom is a double-bedded room and the fourth or courtyard one is a twin-bedded room. Each has its own en-suite bathroom. Under the shade of towering coconut trees and nestled amidst lavish, manicured gardens is the private swimming pool at Sakara house. Dive straight in, swim laps, or dip your feet for a refreshing experience. You can indulge in water games with kids as it also offers a play area where children can enjoy themselves without a worry. A gorgeous Ambalamba is found beside the pool, a perfect outdoor sitting area complete with a BBQ, where guests can relax in the evening as the sun sets and the lights illuminate the entire house. Sunbathe on the sun beds found on the pool deck, or take a nap! 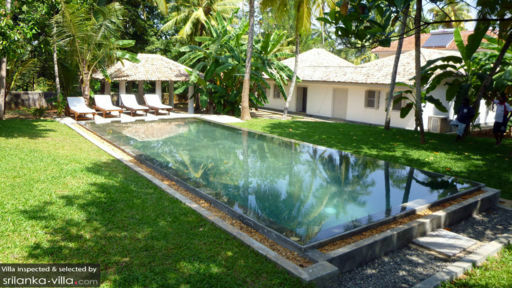 There is even a verandah out front, furnished with a comfy sofa, for snuggling as you take in the beauty around you. Designed in a traditional fashion is the living area at Sakara House which features a high-soaring ceiling, keeping the room well-ventilated and breezy, and large windows for natural lighting. There is a wooden sala upon which you will find comfortable daybeds, cushions, and a cozy vibe where you can lounge all day, listen to music on the iPod dock, or doze off in the silence. Beautiful and intricate lamps cast a warm hue around the room, making you feel peaceful and almost zen-like. The Ambalamba outdoors is where you will also find the dining area of the house, with an eight-seater dining table what better way to enjoy your meals that in the midst of natural elements. The kitchen is fully-equipped with modern appliances and amenities for your comfort and ease. There is a courtyard with a fountain indoors, in the middle of bedrooms and other spaces, with a door that leads to the swimming pool directly. There are many fun services on offer at the house including surfboard rentals and lessons, free bicycles, yoga sessions, chef service on request, free pancakes etc.! Apart from these there is regular housekeeping, barbecue, and other special events that can be arranged including Kandyan dancers, tuktuk transport, etc. for an authentic experience. With plenty of things to do in and around the house, you will be booked and hooked on to Sri Lanka’s many delightful offerings. There are idle tours to explore the countryside on bicycles, visits to the Handunugoda Tea Estate and Factory, water sports, and a safari through the Yala National Park! Sakara House is your ideal vacation house. It has it all: Great location: away from the road and noise in a lush family neighbourhood. Great architecture and decoration: simplistic, elegant and functional thanks owners Lindsay and Carsten's great taste. They run a home deco business in Galle that specialises in textile. Their home is filled with their creations. Rooms: spacious, comfortable, nice bathrooms Great team: guard, cleaning, gardening, cooking, it's all included! The staff is so kind and discrete. You will feel just at home! Home chef Prabath is just amazing. He will cook extraordinary tasty meals morning, lunch and diner, if needed. So much can be done from the house activities wise: surfing, nature tours (ocean and earth), yoga, etc. Thank you Sakara House for an amazing vacation! We already long to return. A fantastic accommodation, secluded in the jungle, but at the same time near the beach, surf, sights and beautiful environments. We were so well taken care of Lindsey and Carsten and above all their wonderful staff. Prabath cooked every day a fantastic breakfast, Auntie cleaned our rooms so nice and Uncle showed us the wildlife on Sakara House and met us always with a smile. An extra big thank you to Kapila who along with his tuk-tuk made our vacation unforgettable. His kindness and dedication, we will never forget. We hope and believe that there will be more visits to Sakara House. Once again, many thanks! We spent a perfect Christmas and New year at Sakara house. Lyndsey and Carsten were excellent hosts and nothing was too much trouble. The house is beautiful and calming, the beds huge and comfortable. Prajbat is an excellent cook and we enjoyed his meals most nights (you have to try his Sri lankan curry). Having Kapilla thier dedicated Tuk Tuk driver on hand meant we could get to all destinations safely and easily. We loved spending days in the lush jungle garden and pool area, our kids adored seeing monkeys in the trees overhead and fireflies in their outdoor bathroom. They also loved playing with the children who became instant playmates which made our holiday all the more relaxing. We also had plenty of privacy and most days had the house to ourselves. Thanks again to the family and the team for making us so welcome, our trip really couldn't have been better.